During its first five years, CEF invested substantial resources into the access to new methods for the analysis of macromolecular complexes. The range of technologies now includes advanced light microscopy, electron microscopy, magnetic resonance spectroscopy, time-resolved optical and IR-spectroscopy and mass spectrometry. 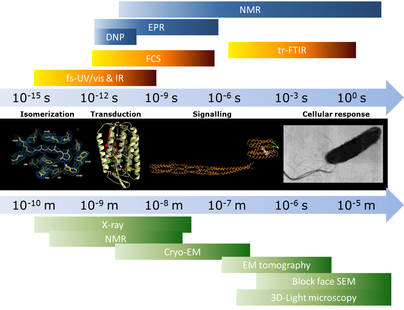 They encompass spatial scales from atomic to organismal, concentrations from attomolar to molar, energies from neV to MeV, and time scales from femtoseconds to seconds. During the next five years, we will focus on an integrated approach to structure and function in biology. We will analyze single molecules and will cover cellular sections, three-dimensional cultures as well as whole organisms and small tissue sections.